Join our training webinar in partnership with the Market Research Society on November 6th! 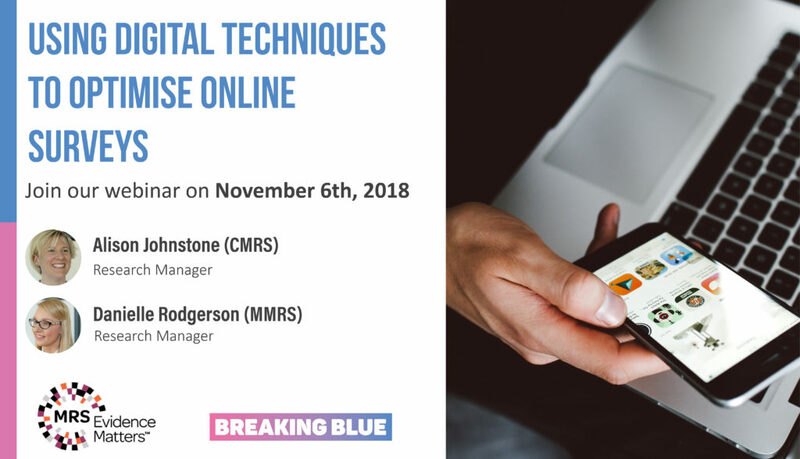 In a world where online survey response rates are falling and surveys are competing for attention with so many other online stimuli, Breaking Blue’s quantitative researchers, Alison and Danielle, will talk about techniques clients and agencies can use to get more out of online surveys, improve data quality and engage participants. Whether on a smart device or on a traditional PC/laptop, we’ll talk about the key challenges to online surveys, and why it’s important to make use of engagement techniques. We will also set out some easy ‘takeaway’ hints and tips for all types of digital survey. This webinar will be useful for anyone who is involved in digital quantitative research: research buyers and agencies, online panel providers and in-house scripters and programmers, those with a focus on UK-only or non-English speaking markets, across all sectors. Alison is an experienced researcher who has worked both client-side and agency-side and regularly delivers large-scale international quant studies for clients around the world. A champion of Breaking Blue’s ‘mobile first’ approach, she designs user-friendly and engaging surveys. Alison is also a practised presenter; she has facilitated conference workshops, delivered a number of training events for junior researchers, and hosted Breaking Blue’s ‘Let’s Get Digital’ event last year. With over a decade of experience in the industry, Danielle is an outstanding quantitative researcher. Her expertise focuses on digital methodologies for health, transport and government sectors. Danielle leads Breaking Blue’s innovation team, developing online tools and techniques to ensure the industry’s advancing functionality is applied in the best way to meet client need. For more information and to register, visit the MRS website.